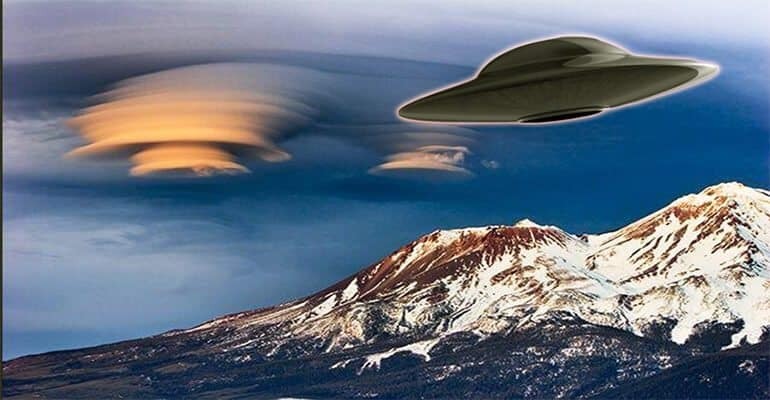 The recent discovery of what appears to be a UFO above the legendary Mount Shasta has reinforced the belief that something mysterious is happening in the area. The odd occurrence appeared on Google Street View and caused an unprecedented stir inside the UFO community, since the place of the sighting is renowned for its richness in unexplained aerial phenomenon. Mount Shasta in California is the central point of a large number of local legends. People say strange activity occurs beneath the mountain due to the existence of a secret and massive alien outpost kept away from sight deep inside the crust of the earth. Native Americans in the area tell stories of the Great Spirit Chief Skell who came from the sky and never really ascended back, but instead he remains hidden underneath the mountain even today. In more recent years, it was speculated that beneath Mount Shasta continues to exist a city established by survivors from the lost continent of Lemuria. As the legend goes, British prospector J.C. Brown discovered the underground city in 1904. While looking for gold, he stumbled into a cave that spiraled down for 11 miles and eventually led to the city of Talos. Brown presumably found giant mummies, gold, weapons and shields but was never heard from again once he decided to carry an expedition to the heart of the mountain. During the last few decades, Mount Shasta shared the reputation of one of the “few global power centers” and plays an important role within the New Age movement. The UFO surprised here only confirms the intense activity in aerial phenomenon depicted by the local inhabitants of the area. Hypothesis on the mysterious object varies. The most skeptics consider the UFO to be nothing more than a raindrop on the lens of the camera, and others have even suggested that it could be a smashed bug. However, the elucidating hypothesis might be the one involving a glider, considering that the margins of the object are curved, and from afar it seems like a piece of cloth in the wind. But further analysis indicate the glider scenario might not be the case either. After zooming in on the picture, its full spherical form is revealed. Its smooth design points towards a refined mix of metals that’s constituting the outer carcass of the object. Upon moving the camera throughout the sky resort, the UFO is no longer visible. Was this caused by a simple glitch, or is it more to it than meets the eye? According to some UFO enthusiasts, the above phenomenon is clear evidence of UFOs on our planet. Their beliefs are based on the fact that other photos don’t show the craft anymore, proving that it traveled at an extreme speed compared to the Google car. That, and Mount Shasta, a renowned place where numerous UFO sightings occur on a regular basis. Are there really signs of activity springing from beneath the mountain? If so, can the UFO surprised by the Google Street View camera be somehow related to this secret activity? yup totally a UFO…err…drop of water.